The ultrasonic peeling. This procedure designed for high-quality skin cleansing, it is used both alone and in combination with other cosmetic procedures. Our device exfoliates a layer of dead skin cells, improves a microcirculation inside tissues, and has anti-inflammatory and immunomodulatory effects. Ultrasonic peeling is a necessary step in the preparation of the skin to other procedures. If you regularly use ultrasonic apparatus for peeling “AS-C2”, the tendency to rapid clogging of pores decreases, the skin tone is flattened, activity of the sebaceous glands is regulated. The phonophoresis is designed for the implementation of active cosmetic drugs into deeper layers of the skin. Phonophoresis increases the diffuse ability of cells. The ultrasonic micro-massage. This is a massage at the cellular level, it stimulates the metabolic processes in the tissues, improves skin tone and elasticity. 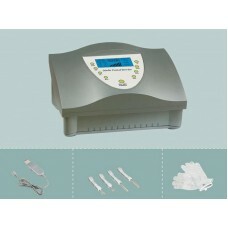 Apparatus “AS-C2” has defibrosing effect on connective tissues, stimulates the synthesis of collagen and elastin. Micro-current therapy is an electro-pulse technique for face and body. Micro-current therapy device “AS-C2” has a regenerating effect on the cellular level, antiedematous and detoxifying effects, it improves skin tone and elasticity of the tissues. Micro-current therapy is used after invasive procedures (laser peeling, microdermabrasion, etc.) in order to speed up the healing process, it reduces sensitivity and itching. Micro-current therapy device “AS-C2” has a variety of programs for work on the face and body. There are several types of electrodes: forked electrodes, acupressure electrodes, special electrodes is gloves for the face and body.